The Men in Black are back! 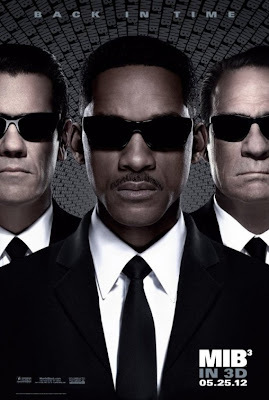 Agents Jay (Will Smith) and Kay (Tommy Lee Jones) don their suits and shades once again to maintain extraterrestrial peace on Earth in the third instalment to the Men in Black franchise. When Jay wakes up one morning to be told that his partner Kay has been dead for 40 years, it suddenly comes to light that the villainous Boris the Animal (Jemaine Clement) has escaped from a high security prison on the moon in order to travel back in time to 1969 - the year that young Kay (Josh Brolin) captured and arrested him - in order to kill Kay before he has the chance; therefore allowing Boris to launch a full scale attack on planet Earth. On learning this, it is up to Jay to use a time jump device to go back to 1969 himself to stop this plan and save Kay in order to restore normality in the process. Will Smith is one actor who has had an extraordinary career, now standing tall as one of the highest grossing film actors in the world. What makes his career so fascinating to examine is to look at where he started off in comparison to where he is now. TV show The Fresh Prince of Bel Air, in which he played to skinny hip-hop clown Will is what well and truly launched Smith into the spotlight - with millions still watching re-runs of the old series still today (tell me you don't know the theme song - I dare you!). Now he has become something entirely different, a big action star who also lends his hands to working on more personal, emotional and challenging roles from time to time - a truly mad evolution! The original two Men in Black films sat nicely in the centre of this change, as Smith started to become the action hero but still maintained his comedy side - basically the character of Jay in a nutshell. And that is one of the first problems that I had with the film. It becomes almost bizarre and jarring to see Smith revisiting his black comedy roots again in MIB3, as he says lines that are fine when he is twenty-odd years old, but seem a bit off coming from his more mature adult image today. But this is just a minor quip. 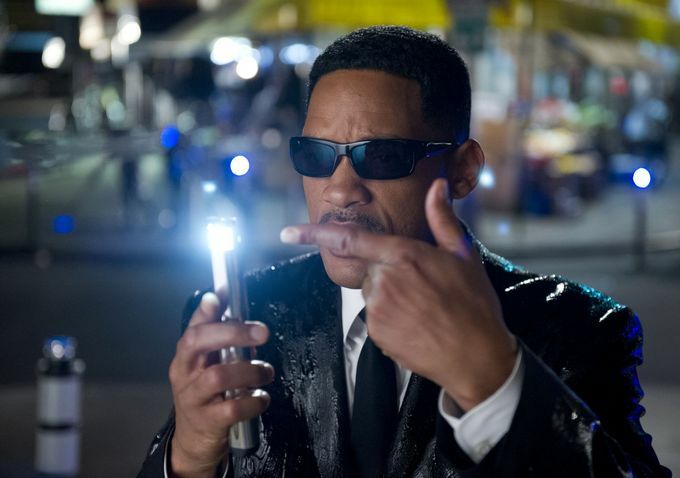 Agent J (Will Smith) in MIB3: "Everyone look here *flash* Okay so Men in Black 2 and 3 were never made..."
As a personal fan of the original MIB film, yet not so much for its sequel, I really hoped that this one could be more in line with the first one - I'm disappointed that it isn't. One reason for this is because it in some ways loses its MIB-ness in the process of its time travel storyline, with the iconic MIB headquarters from the first two films only being fleetingly used as the characters spend more time running around the country and through time instead. Some of the alien banter that was seen in the first two films is often missing here, with less jokes and witty one-liners being made at the extraterrestrials and physical fighting both being replaced with quick zaps from blasters and exploding bodies. Alongside these, a lot of characters also fail to return to the film, with the once prominent twiglet-like aliens having about one line as they walk by, the much-loved talking dog being reduced to just a photo on Jay's wall, and to make way for a love interest in Thompson's Agent O the old leader of MIB Zed, well let's just say 'Zed's dead, baby. Zed's dead.' Director Barry Sonnenfeld has unfortunately forgotten a lot of the things that made the first film so loved. Unfortunately after an alright start, the film does start to sag in the middle of the film and generally gets a bit boring with it not providing as much humour or action as you'd like it to. When the film reaches its climax, you can't help but wonder why they bothered at all, with the whole film in hindsight just seeming a little bit pointless overall. However the film is not all that bad, and it does have its highlights. The first film was as successful as it was because at its heart laid the relationship between Jay and Kay, and how it develops as the two of them train and work together, contrasting and complimenting one another with their grumpy old man and young hip kid act. Whilst the second film lost track of this factor and became a generic sequel with little character development, there is far more of this in MIB3 with the entire film essentially revolving around their relationship. Although having said that I still find it bizarre that 15 years of working together hasn't solved the problems that they have already!? The time travel element of the film also provides a refreshing twist, with a lot of humour to be found in the 1969 setting that the film jumps back to - I particularly enjoyed the stylistic elements here with the aliens looking like they were designed in the 1960s. Whilst the film doesn't feature as many laughs or as much action as the first, it still has enough there to make the film an enjoyable affair, and it does get going again quite nicely towards the later end of the film, with its heartwarming ending - although arguably an unneeded sub-plot thrown in probably just to get Smith's interest - does wrap things up nicely. On a side note, as are a lot of other people I am personally not a fan of 3D, but have gone on the record for joking that MIB3 could work in 3D as the cheap plastic glasses resemble the shades that the MIB agents wear (just check out the poster at the top) - almost making you one of them! In all seriousness it's not worth seeing the film in 3D (nor is it really worth seeing any film in 3D), and like in Prometheus the other day I found myself removing the cheap plastic glasses at times to notice just how much of the vibrancy and colour that you lose from each of the films by watching them in 3D. 2D is simply cheaper and better! End of Rant. Men in Black 3 is now showing in cinemas across the UK.